Time really does fly. Before I knew it, I'm well and truly in race season, my final exams done and with them, my degree! I remember this time 3 years ago, I didn't even want to go to university. But boy am I glad I did. And all this has brought me up to now. Enjoying my holidays at home in the glorious West Country sun, and only a few hours since pinning on a race number in Cardiff. I left off last time in the run in to the National Sprint Champs at Thorpe Park. Second time competing in this race and feeling confident after a positive hit out at Eton Dorney two weeks before, and some quality training in between back in Loughborough. So game plan was set. Go fast and see what happens! Thorpe is always an early start, and based on my race last year, not the ideal triathlon race venue. I'll just have to bite my tongue and push through, it's the same for everyone else. 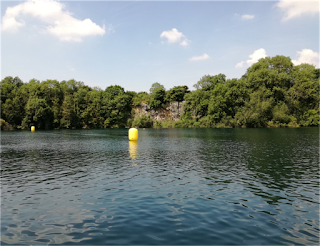 A rather unique swim, with the final 50 metres being in an adjacent pond with a metre wide channel dug through the dividing land mass between the main lake and the pond. Fair to say, trying to get 20 strong front pack through that was not fun. But I'm getting ahead of myself. Pre-race went smooth, getting set up in transition nice and early leaving ample time to warm-up and chat with friends and Loughborough team mates. Always nice to relax and take your mind of the nerves with a little bit of a chinwag. Finally into the water after a delayed start and the race was on. I had clean water and plenty of space, and a cracking start. Neck and neck with semi-pro Sam Wade and Lboro team mate Zac. In the final run in to the bottleneck our front pack which was well organised before, suddenly spread out into one long horizontal line and I was pushed out the back. I held the feet as I knew trying to swim round was a fruitless effort. Hit the narrow channel with standing athletes in the shallow water blocking my way. I attempted a vault using someones shoulder as a platform and succeeded, claiming a small strip of clean water into the run in. The poor guy who I dunked wasn't so happy and took it upon himself to grab the zipper of my wetsuit and undo it. Leaving me swim the last 50 metres with effectively a parachute. Fun. Out of the water and into T1. After the fluster of having to be dragged out because the grass verge was too steep to climb I ended running down the wrong side of the racking, so after a rummage through bikes, I had my wetsuit off and helmet on, and on my way. The first 1km ish of the bike is on the Thorpe Park service road, plenty of potholes and tight corners, so no time was gained back here. And in stayed that way for the majority of the 21km bike course. Still not quite able to hold my own on a TT leg. But it wouldn't have been too bad this time, if the majority of the field weren't drafting. Some very questionable riding and marshalling practice going on, leaving me feel a little discouraged to continue racing in such a field. A lot of these athletes race the draft legal calendar and so should know better. Especially if they are rocking up on TT bikes with disc wheels etc. No penalties were given, but advantages were made by these athletes. As a Loughborough team, we raced honest and fair to the rules of non-drafting competition and the National Championship event but its a shame that this is happening in the biggest AG races on the calendar. Using my position within the Loughborough Triathlon scene shall we say, I sent a strongly worded email to Triathlon England just to clarify what went on and called for a thorough reassessment of their marshalling policy at National Championship events. Just doing my bit to politely improve the sport in any way I can for everyone. I hit the run, feeling a little worse for wear and didn't hit my stride until the 2nd 2.5 km run lap. Not losing too many places either, I was pleased with my result. 8th in the Nat Champs category and 35th overall, against a strong field. Or cheating field, depends on how you look at it. Drive home, feet up and then back to Lboro the next day for my last exam. Back in Lboro and exams done, it was training time before Cardiff 3 weeks later. Upon my return, I made a quick decision to return home for a week. Take some time away from the Loughborough bubble whilst many of my team mates and friends were still hard at work with exams. Nice to spend some time training at home, and of course spending time with the family. And throw in an aquathlon at Vobster, the week just kept getting better. Decent training run with an 8:50 750m swim. My second fastest over the distance by a mere 1 second, but considering it felt a bit laboured, I'm more than chuffed. Good hit out on quite a tough run course. Clocking a high 18min 5km was a really positive step. Going out on the first uphill 2.5km in around 10min and coming back on an 8min was great. Felt really good once I hit 2.5km. Good signs for the National Aquathlon Champs next month up in Peterborough; I think. And that just about brings me up to Cardiff. The second ITU Sprint Qualifier. I think I have already secured a place in Lausanne for next year, but it's always good to get another race in the legs. The more draft racing I can do, the better as I look to target some elite racing next year. New venue and slightly different field, but still plenty of familiar faces to chat to. Smooth set up and warm-up in the rapidly increasing heat on Cardiff Bay and then we were in and off. Decent start, got bashed around a bit as usual, a few too many people on the right all of sudden veering left. Cresting the top of the course, wake from sport boats on the other side of the bay made its way over. I sighted just before they hit and got smacked right in the face by an oncoming wave. The next 100m were an uphill struggle, and I lost contact with the front swimmers. The long straight back onto shore was a blessing and a curse. No turns to slow down for, and an excellent line of sight. I made way onto the back of the front pack and exited within the top 10. Happy with that, I ran hard through the long T1 and reached my bike on the right side of the racking this time and ran out, in an amongst a small group; including Lboro alum Mika Brown and James Hodgson. Working pretty well with a couple more athletes, we tried to catch the leading 3 who just edged us out of T1. It wasn't working, and 2 laps in, Luke Campbell and his group caught on. A much larger group was just as ineffective and there was some sketchy riding going on. Me, Luke, James and a lad from Bath Uni decided we needed to control this, so hit the front and kept out of trouble. I dropped a few hammers today out on that course, and with technical sections and 3 dead turns per lap, it was tough going. And it really showed on the run. I hit T2 at the front of the group and had no issues, sprinting out with the leaders, James and co from my group. Learning my lesson from Eton, I took advantage of this awesome position and went toe to toe with James. 1km later, those dead turn sprints caught up with me. Survival mode activated as the heated started to really pick up. Tried to hold my nerve and my form, but each knee drive was getting weaker and weaker and the run into the finish was a welcome sight. Post-race chat and analysis ticked off and some training weekends planned with Luke and James for this summer, I headed home for a Sunday roast, perfect end to a cracking day. Finished 22nd overall, strong field and tough conditions. Every race is progress. I can't wait to see what's next for me! Kudos again to Luke and James! No matter the race result, its always a pleasure to toe the start line with these gents and rip it up out on the course, wherever it may be! 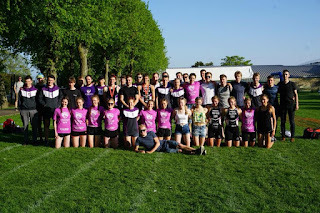 Thanks to Loughborough Triathlon, its been an emotional end to my academic career, but by no means am I finished with Loughborough, as I look to start work in sports development there for the foreseeable future. The next chapter is exciting. But I couldn't have got here without the support of so many incredible people and teams. Shoutout to Frome Triathlon and Paul Ryman for helping me start this journey. 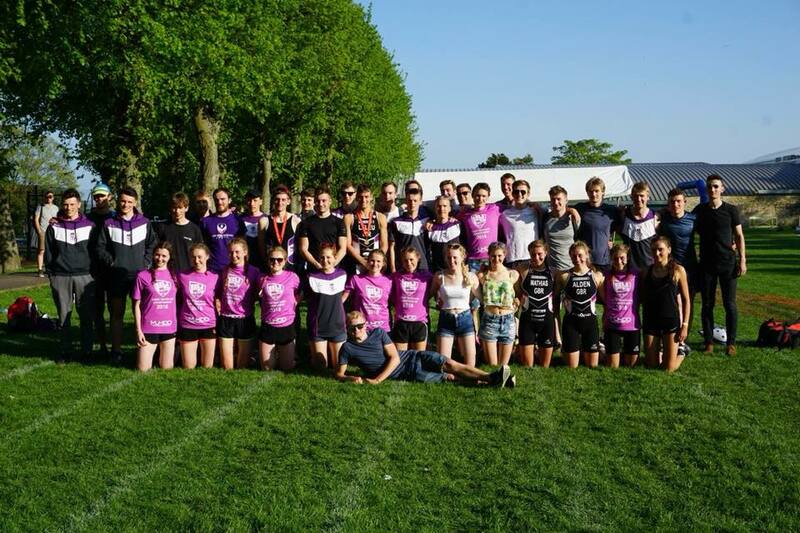 To all the students and coaches of Loughborough Triathlon over the last 3 years, thank you for everything. Extra special kudos to Jack Hall for taking me on this year; giving me the support and structure which I desperately needed. And really, for backing me 100%, even when I wasn't backing myself. To Pedal Potential, to whom I thank for their support. I wouldn't be able to afford the costs of these national events without Mark and the rest of the team. And last but not least, huge thanks to my number one fans and support crew, Mum and Dad! 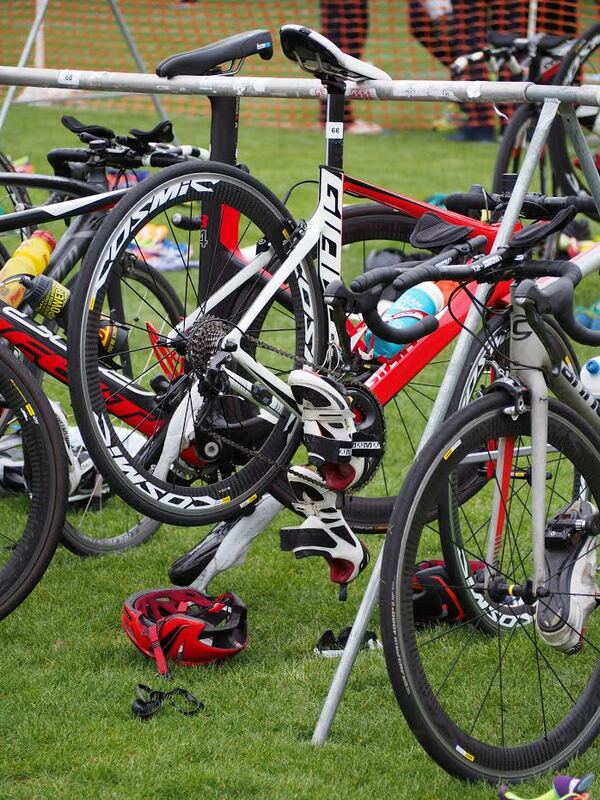 Check out Luke and James' blogs for amazing insights into their triathlon careers! Final race prep in Mallorca and Lboro has been and gone. And so race season and exam season have officially arrived. It's crunch time then, as I draw ever closer to graduation. And so it seems apt that I do a bit of reflection now as I look back on my final race prep. I left Mallorca in the second week of April and returned to 'sunny' Lboro in time for the start of my final term at university; and feeling pretty strong and raring to go. Followed by some easy training for a week or so, to let my body recover and work on some of the weaknesses identified from training in Mallorca. Having been there for 3 years running, I was worried I would have got bored of the location. But a new year brings a new group of people. And our 30 strong mob of triathletes meant that there was never a dull moment. Kudos to the team! As I had eluded to in my last blog, falling back into reality following the end of tenure of Club Chair for Loughborough Triathlon was tough. I had my ups and downs during that time, but it was the most rewarding experience of my life so far. I did take some time to enjoy my lack of responsibility whilst also doing my bit to help train up the next committee. It's important to me that they do a better job than what was done before. To ensure the club continues to develop. And at the time of writing, my involvement has been all but concluded leaving me a little melancholy and lost for what to do. I've never had this much time on my hands. But life is life and throws other things in straight away, to make sure I don't get too complacent. The most important thing being, finding life after Loughborough. But although my studies finish this June, I am by no means finished with Loughborough. I stand by my long term career ambition to have a successful career in sports development and management with British Triathlon and Loughborough is the place to be to work towards that. The perfect stepping stone being the AU Intern role here in Loughborough. Unfortunately, this time I was unsuccessful but I push on regardless, looking for other opportunities to contribute my passion and experience to the sports industry. I am incredibly grateful to all the staff and students at Loughborough Sport for all the opportunities, and whilst I didn't seek praise and or broader recognition. 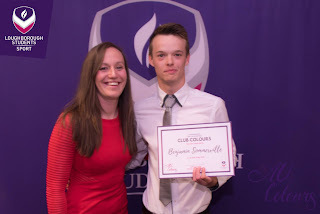 I was incredibly humbled and honoured to be awarded Club Colours from the Athletic Union this month, in recognition to my contribution and services to Loughborough Triathlon. And then 48 hours later, received a small gift from the tri club to recognise those efforts once again. And this one was emotional, although I tried not to show it on the night, as it was a framed picture of the team after BUCS Sprint this year. Which was to be my first race of the season. But most importantly, an incredibly successful outing for the team. Incredible sense of pride felt for everyone - such a fantastic squad and group of young people. BUCS Sprint then. May bank holiday weekend, and so my fellow Britons will remember the weather on that one. Was always going to be tough, given that it was my first outing of the year and 23-24 degrees on the day. 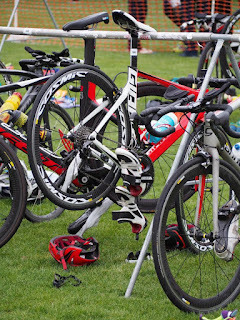 Race plan was comfortable swim, drop the hammer on the bike and hold on for the run. All was well as hit the roads on the bike. Nothing special about the swim, but I knew the time would be lost on the bike-run if I didn't get a shift on. One of the best non-drafting bike legs I think I have ever done, coming in minutes before any of the team expected me too. Super motivated from then, and so I tried to drop the hammer once more in and out of T2 and make the most of my consistent run training. Worked for about 1.5km and then boom. The legs fell off. Oh well. I brought it home as best as possible but was still slightly disappointed. But then again, I am sometimes too critical for my own good. I'm working on it - I promise. All in all, good start to the year. Work to be done, but good fun in the end. That's a win in my book! Back to Loughborough then. Training resuming straight away, in readiness for Eton on the 20th May. The big race of the year and the first opportunity to really find my form and show what I can do. Really happy with my mental and physical preparation for this one. Setting myself up for a strong performance in a super competitive field. Come race day, there is a small group of Loughborough athletes whilst the rest are off competing at BUCS Standard. And so we were chilled out, preparing well and shooting the breeze before our 10:10 am start. And looking fresh in our new threads too. That always helps with the confidence, when athletes around the venue take one look at the Loughborough shield blazoned across our chests, letting out a worried sigh in response. In the water, I reflected on the race plan: give it a nudge in the swim, try and hit the front. Regardless of position, go hard on the first bike lap, make it hard for everyone, using my experience and strength in draft legal bike racing. Then run hard, but run well. Excellent strategy, which almost worked. Just missed the front pack in the swim. Ended up having a fight with a couple of swimmers in the first 100-150 metres. Losing time and clear water. Didn't panic, held my nerves and kept a good tempo, only falling 15 seconds shy of the front pack. Who were caught within 2 bike laps by myself and a small motivated bike pack. We worked exceptionally well together, and then drew the field into one pack with some stragglers behind. After my 2 lap effort, I withdrew to mid-pack to rest. But with an eye open for gaps that appeared, closing them if those behind couldn't. I knew the field, with some big hitters like James Hodgson and Jack Shayler alongside me. So I kept close, sat in and recovered ready for the run. Dodgy T2 meant I lost 20 secs at least from Jack and co. I kept my cool, not setting off too hard and blowing up like I did only 2 weeks before at BUCS. Felt super comfortable and strong but held a strong tempo which felt faster than it actually was. The heat was also starting to crank up so I was cautious when 2 athletes came by. In hindsight I should have stuck on their feet and ran with them to the finish. But I'm still learning what my new limits are when running; having never had this level of consistency before. Lessons learned. Next time, I know I can do better. Brought it home in 19th. Super chuffed with that performance. Always love racing at Eton, but they really need to double check the swim course and consider widening the starting pen just a tad. Other than that. Cracking day, finished off with tri club BBQ and awards evening. Before a well earned sleep. Up next for me is Thorpe Park on the 3rd June, sandwiched between my final exams. Big thanks to my parents for supporting me through all my endeavours, both in and out and sport. Big kudos to the coaching team here at Loughborough Triathlon: Piers, Beccy, Rich, Ailbhe and Jack for all your support over the last 3 years. Special thanks to Jack for the extra support you’ve given me and for your friendship. It’s really made all the difference. Thanks to Paul as usual for starting me down this road, great to catch up with you at Eton last weekend. And thanks to Pedal Potential for their continued support. Enabling me to race at the biggest and best races in the country, and to continue doing what I love. Thanks for reading! Please give this a share if you can! See you next time! It's the final countdown indeed. With a month left to go before race season, the pressure is on. So what better way to deal with that pressure in a constructive way, than to be in Mallorca for 10 days. The perfect pre-season prep camp location and the stunning weather to match it. 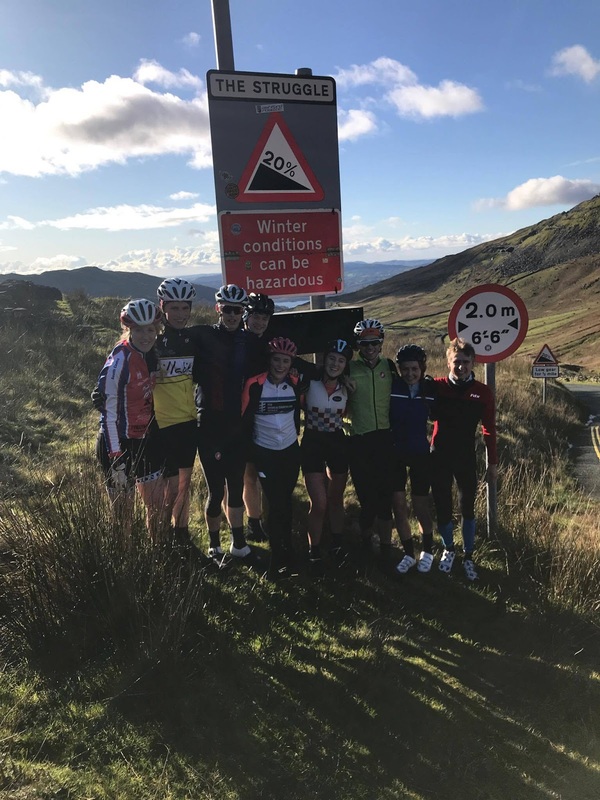 Even better company with a 30 strong squad from Loughborough Triathlon hitting the sands, sea and silky smooth tarmac together, getting the work done and making the most of living like full time athletes, even if it is only for 10 days. The last two years we have stayed in Pollensa on the north east of the island. But with 30 people this year we've had to move 10km down the road to Alcudia and into 7 adjacent apartments on a holiday resort right on the coast. Day 1 was a long travel day with a bike-run double session after we hit the tarmac. 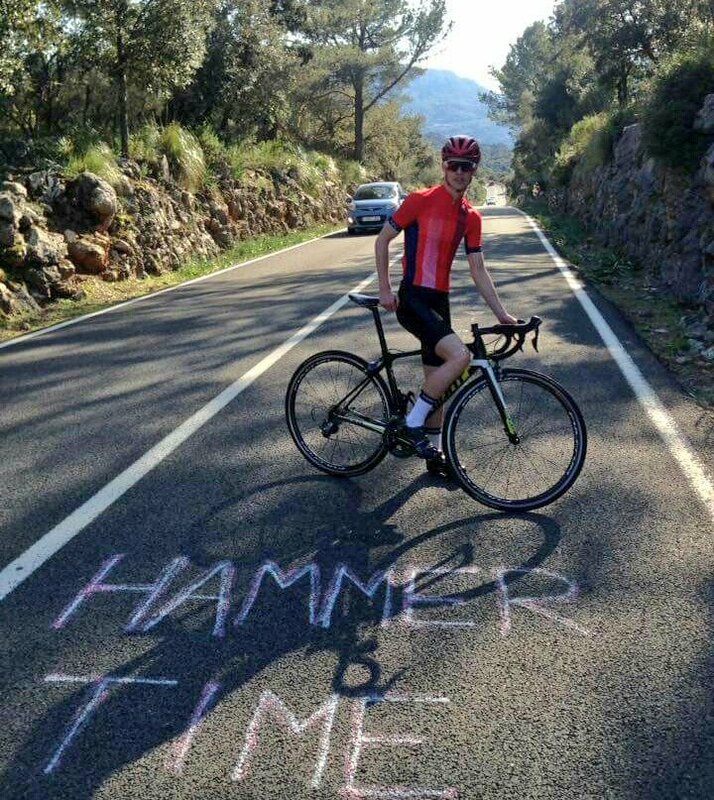 Tough going after not much sleep but a greAt ride to kick start the camp up to Formentor - Loughborough Tri tradition. It was quite the sight for the locals for sure, with almost all 30 kitted out in full Loughborough colours. Very proud of the team which I've had the privilege of being chairman for the last 12 months. A run which unfortunately has come to an end. Day 2 we made our way to famous climb Sa Calobra to test the legs. Fair to say, my climbing legs aren't there just yet. But my bike handling and descending skills aren't the joke of the team anymore which is a relief. All the hard work in that regard is finally worth it. Got to hand it to the bike I think! Day 3 was a triple day, with a sea swim early morning, followed by a 70km ride on the flat lands. With an impromptu 8km chaingang on the way back into Alcudia. Cracking little smash, and good prep for some draft legal racing this year. Rounding out the day was a 30min run shortly after, just keeping on my feet whilst I get back to running after having a niggle for the week before camp. Some key bike and run sessions planned for the rest of the camp, so I'm resting today after a 2.5km sea swim in the sun and followed by a couple hours of dissertation work. Really glad I'm in a better place mentally and physically this year on camp. It's nice to be confident in my training and season priorities. This way I'm maximising my time and doing the correct training for me - not doing training for the sake of following the crowd and potentially burning out before race season even starts like I did last year. More updates to follow. And plenty more sun filled pictures of my adventures out here! As always, big thanks to Loughborough Triathlon and Pedal Potential for the support this year! Race season can't come soon enough. Although, if I could stay in Mallorca this summer, I absolutely would! I think my new year's resolution last year was to write blogs more often. I think it's fair to say that didn't work. So I have a lot of catching up to do unfortunately. First of all however, I would like to say a massive thanks to Pedal Potential and Loughborough Students Triathlon for their continuing support. This year, I am going above and beyond to ensure that I continue to improve and perform at my absolute best. Time to make a race season properly count for something. I think I left off last year as I was making my way back to sunny Loughborough for my third and final year of university. How time flies. It's certainly been a roller-coaster since then, to say the least. With some pretty fly highs, but some miserable lows. I guess that's life for us student athletes. I'm a very ambitious person, by my very nature. And coming into my final year of studies, as well as balancing personal sporting commitments, being Chairman of Loughborough Triathlon, with a scrap of social life sandwiched somewhere amongst this all, was definitely an example of me biting off a bit more than I could chew. Or at least that's what I wish I thought in March last year as I began on this action packed, ambitious and risky journey. To cut a long story short, it's not been easy. Oh no. It's been really tough, both mentally and physically. And whilst in those down moments, I just wished I hadn't started down this path in the first place. It really was all worth it. As I write this, I have escaped the claustrophobic Loughborough bubble for a long weekend away at home. A chance to focus on my neglected studies and of course my dissertation. Which is due very soon! The pressures of such a high performing training environment and having to be in charge of said enterprise is utter madness. And with a couple of minor injury setbacks in Nov-Jan. My lofty confidence I had built from August was beginning to crumble. I had not properly 'rested' mind and body since March 2017, and it was starting to take its toll. I took ownership of these struggles fairly early on by my standards and began to be a bit more selfish with my training and my time. Whilst I enjoy being there for others and supporting them as much as possible. By BUCS Duathlon in November, I realised I had gone too far. My mentality up to that point worked and has been praised and appreciated by many, but then again, I'm not in it for the vanity and the praise. In reflection I wasn't an athlete myself until the last race number had been handed out. I have had many commend my maturity and the sacrifice which was great but I had no time or mental energy as a result to work towards my own goals. Saying that, I still managed a half decent race at BUCS Duathlon. And as if by some miracle, it was actually quite mild. Not the usual frosty, dark wasteland of run-bike-run torture. But I am getting ahead of myself. 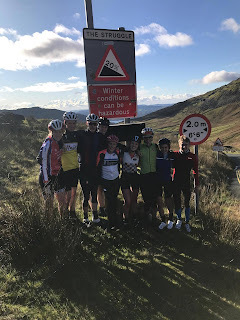 Only a couple of weeks before, I was in the Lake District with the squad, for four days of hilly miles. Oh and an impromptu get together with the Brownlee Brothers and the Leeds Triathlon Centre, more on that later. We were staying at YHA Ambleside this year, which is considerably more upmarket than YHA Langdale; last year's abode. Worth every penny though. Situated right on Lake Windemere, it was nice to get some crisp, fresh lakeside air for the weekend. Tackling famously tough climbs such as Wrynose and Hardknott Pass and The Struggle (aptly named by the way) as well as running the picturesque Keswick Parkrun; we all had a cracking time. And only one major crash/hospital visit. That was fun...not. We more than made up for this ending up on a night out with the Brownlees at a local pub/night club in Ambleside. A lasting memory for all and an encore definitely on the cards for next year! Loughborough and Leeds...not always rivals. But we had to return to reality and back to the Loughborough bubble in preparation for BUCS Duathlon. Stressful time for me more than most. But it was another cracking event for the team. Our highest recorded turnout and the day ran as smooth as silk. Not bragging at all there... team bronze and overall team gold was the icing on the cake and whilst everyone celebrated on the coach during the 4 hour journey home. I had a nice long nap with the bottom floor (of 2) on the coach all to myself. For the most part, I was rudely awakened around halfway home by a few athletes demanding I make a victory speech. I politely accepted and 10 mins later I had written and delivered a pretty good speech. This history degree is paying off. And that's what I have mostly been doing since then. For once, I am doing more degree work than training. But reduced quantity of training as given way to higher quality. With a new coaching network I have been able to train smarter than better before. And it paid dividends, with dramatic improvements on the run and the perfect base for faster and faster swimming. And I also came out of the first semester with an overall 1st. I was ecstatic to say the least. Turned out I wasn't doing as bad as I had thought. I've had a few moments in training where I feel like I slipped up or didn't meet my own high expectations. But my new coach has been incredible. Allowing me to talk it out and put things into perspective. I have a new lease of life and fresh confidence in my ability to achieve my goals both in and out of sport. And with 1st class degree on the cards and the dream job lined up (fingers crossed) I just can't wait to get properly stuck into racing. So I have talked about the Lakes. But why have I put London and Liege in the title as well? Well as part of my dissertation research I was invited by the Falkland Islands government to visit their offices in Westminster, London to chat with staff and gain some more insight. I made a bit of a tourist day out of it, visiting the Imperial War Museum, Houses of Parliament, Buckingham Palace and the Natural History Museum. A very enjoyable albeit expensive day. Now Liege was a big one. 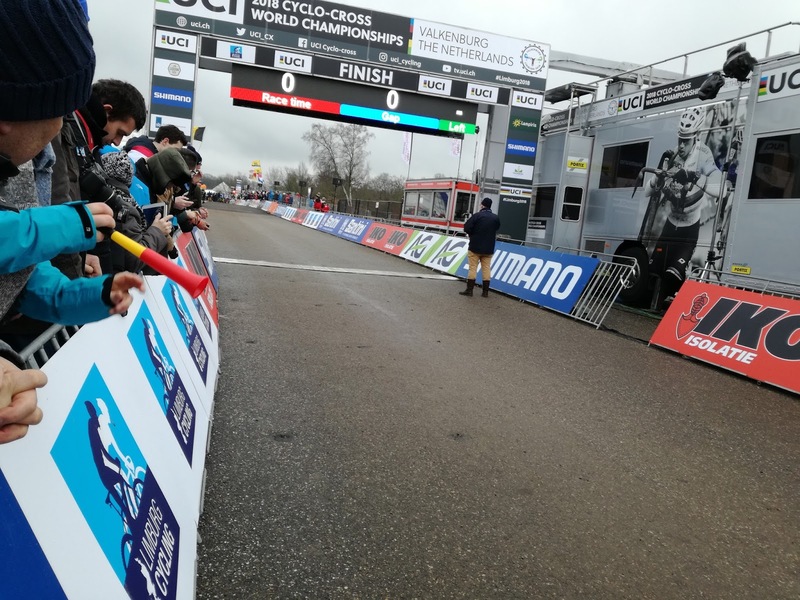 In the first weekend of February, those in the know will recall that the World Cyclocross Championships were being held in Valkenburg in the Netherlands. Me and my triathlete house mates had caught the CX bug and decided in Nov last year that we were going. And so we did. In the space of one weekend, we visited 3 different countries and had been understandably amazed and inspired by the quality of athletic talent on show at the World Champs. It was bitterly cold, and ridiculously muddy but a great experience. One which I will never forget. I think next winter I might also be investing in my very own CX bike. Let's just hope I can stay upright long enough to make the most of it. And that just about brings me up to today. The rest of February has been both positive and negative and I'm in the process of rounding out my tenure as Chairman for Loughborough Triathlon. Not in an hurry (although it will be a massive weight off my shoulders) as we have some big projects to finish before my committee handover to the next at the end of next month. I celebrated my birthday this month but it was bitter sweet, as emotionally I had hit a low point and didn't have the energy or motivation to cope with everything that has been going on around me. I've come home, I've rested, and I've just about caught up with the dissertation work I wanted to. I'm refreshed and ready to go. Mallorca, you can't come quick enough! Thanks for reading! Please share if you would like! Check out Pedal Potential to follow the journeys of all the other fantastic athletes supported by the equally fantastic scheme! As the title suggests, 2017 really has been a funny old year; and its not even finished yet. Well my race season has so that's close enough. It started off a bit rocky, and then picked up a fair bit as the summer months rolled on. As I'm writing this now, I have finished my summer work at Longleat and now enjoying my 4 or 5 days end of season break; before heading back to sunny Loughborough this weekend. From the 21st May right through to the 10th of June, I had 4 consecutive race weekends. The racing alone didn't phase me. But the amount of travelling involved did; especially since I was travelling between uni, home and events all in the space of a weekend. And then all of that four times. It started off with my worst result in a long time at a race where I should have been on top form. Eton Sprints ITU Qualifier... After a poor swim, I all but gave up entirely and just continued to go backwards over the course of the 21km bike and 5km to the finish. I was absolutely defeated. But I couldn't wallow in my self pity for long. I had the British Champs up in Scotland only a week later. And quite surprisingly, the weather was fantastic. But more importantly, I was eager to make amends from my race the week previous. Again, I didn't exactly take the field by storm, but it was an improvement and I was a lot happier and more relaxed. I think a lot of the time, I get too nervous and overthink my race; putting pressure on myself unnecessarily. And in the end, I just make it a hundred times more difficult for myself. This race went a little better spending race day with Paul Ryman, long time friend and previously a coach to me. We had a laugh and we had a good race. A winning combination in my opinion; and a valuable lesson learned for the future. A week later, I was on my way to Thorpe Park for the National Sprint Champs. By this point, I was pretty tired but still excited for another race as always. Crazy early wave start of 6:50am but I was off on the 750m swim. The one thing that has always been there and thereabouts is my swim. I was leading this one out, on track for a 9min 10 ish swim exit. But with the sun glaring in my eyes and no lead kayak to follow. I took a 90 degree turn round a buoy instead of a 45. Fair to say, I went a bit off course...oops. Managed to re-catch up with the lead swimmers who I was leading previously and exited in around 9min 45. But still first out of the water which was a relief. All together not too shabby after my little detour. The bike course was made for TT specialists, and that is not me, yet. So naturally I lost some time and positions from there to the finish. But still the run was just not there. I was injury free at that point, but still not with it which was frustrating as I was getting in some decent run work in at Loughborough. But hey, I was up and running, not limping around like I was only a couple of months before. And then to close on this chapter. WTS Leeds, Sat 10th June for the National Aquathlon Championships. I was really looking forward to this one, as I have developed a bit of love for the Aquathlon discipline over my 4 years in triathlon. Short and sweet, and involves swimming. Just perfect! It's a tough course at Roundhay Park, and it attracts some stiff competition every year. The only real downside, other than the ridiculously hilly run course; is 15 degrees C water. I really do not swim well in cold water. Not well at all. But I had my best run in 12 months, and for once I was taking places rather than losing them. For the first time in a long time I was enjoying the run and this just allowed me to run even better. 12th on the day, and I was more than thrilled. Into July now, and my summer holidays in Somerset had properly begun. And that meant jumping back into Vobster Quay. Practically my second home over the summer months. And with the fantastic weather albeit very brief, the water temperature was hitting 21 degrees, which is positively tropical. And I had the perfect opportunity to test out my swim form at the Vobster summer aquathlon series. For the July race I opted for a 1500m swim TT only and was more than chuffed with the result. 17min 40secs for 1500m. I didn't believe the stopwatch if I'm honest or that the course was accurate. But I was reliably informed otherwise. I don't think I can give my Zone3 Vanquish all the credit (I had to train pretty hard for a result like that) but it honestly is fantastic piece of kit. Best £475 I have spent in my life. On a bit of a high and only a few days later, it was the Frome 5km, 10km and Half Marathon. I was racing the 5km again, just to see what I could do. What I discovered is that I am terrible at pacing myself. Went off like a lunatic and then to no one's surprise, the legs well and truly fell off. But I still had good fun wearing my Loughborough vest around the streets of my hometown; much to the dismay of my local tri club. And to top it off, I came second and won a pair of socks. To close off July, I made my way over to Malmesbury in Wiltshire to spend the weekend with fellow triathlete and Strava enthusiast Luke Campbell for a spot of training. The weather was awful but that didn't stop us having a cracking weekend. I even managed to persuade him to race the Frome Sprint Triathlon in August so we could battle it out. One thing became very clear after that weekend, Luke is a lot more photogenic than I am. I can't seem to take a good picture no matter how hard I try. But I try, surely I get kudos for that at least. By this point I had been working for 2 weeks or so and had seemingly gone from part time to full time. And by August, I was working 6 day weeks, 9am - 8pm pretty much. It was intense and didn't leave much time for training but I was still looking forward to the Frome Sprint Triathlon. I turned up nice and early as my dad was chief timer for DBMax on the day and got set up in transition before most people had even got out of bed. But oh well, I had some time to kill, so I went for a little nap on the poolside balcony for a bit whilst I waited for Luke to arrive. I was super relaxed and me and Luke just chilled out really. Had a few too many laughs, did a good warm up and before we knew it, we were off. I knew I would have Luke on the swim, but I made sure not to smash it as the 25km bike course is a hilly one. 2nd out of the water and first into T1 got me off to a good start as I made my way onto the bike course. I had done well to keep Luke off my wheel up to about 5km in. But he did catch me in the end. From then on we were pretty much riding neck and neck, pushing each other on. Me dropping him on the uphill, Luke dropping me on the down which is fair enough. I think at one point, we started chatting to each other side by side on the bike as if we were out for a Sunday morning cafe ride, not mid-race at 27mph on a quiet country lane. Into T2 at the same time as expected and Luke knowing full well that the key to beating me is to go hard for the first 1km of the run; did just that. Fair play. I kept him within sighting distance the whole way and only lost out by 36 seconds in the end. If you were to have a look at the final results, you will see that myself and Luke accrued a 2min time penalty each as a result of inconsistent marshaling out on course. It meant that we were 5th and 6th overall, instead of Luke 3rd and me 5th. I'm still happy with the result regardless but slightly gutted for Luke missing out on the prize for 3rd overall. A couple of tiresome work weeks later, and it was South West Champs time!!! I absolutely love this race. Flat, fast and always well attended. Fair to say, I had my work cut out if I was to place well on the day. 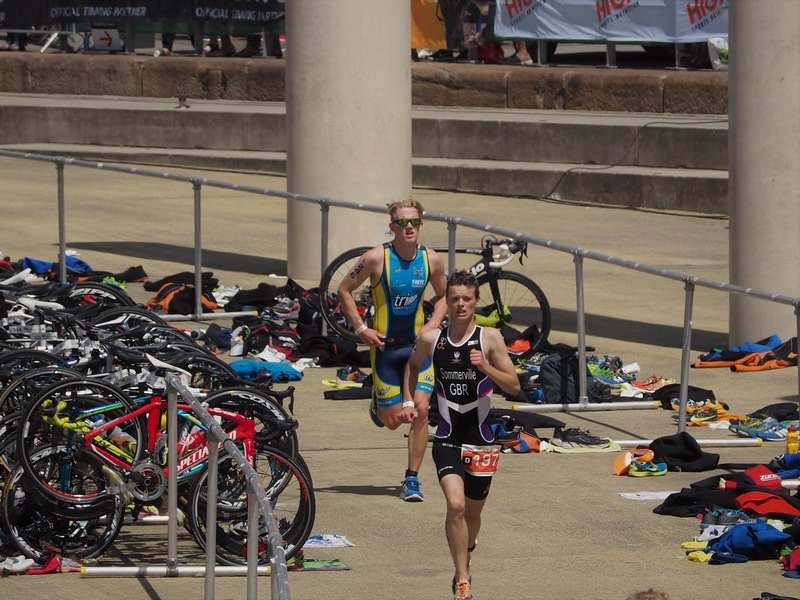 Unfortunately, Luke decided to enter himself for the Elite wave, to chase down some prize money whereas I stuck to the open South West age group category in the hopes of topping the 20-24 regional podium. In hindsight, I should have gone for the Elite wave, I would have placed third elite male and taken home £100 in the back pocket. Regardless, I wanted to have a fast race and was pleasantly surprised to come in comfortably under the hour. First out of the water again (I could get used to this) in 9min 08 and an average bike split kept me in contention for a top 5 position overall, and I managed to maintain that with a 17min 02 run split to finish. Luke came in 2nd overall around 50 secs quicker than me but 5th is good for me. The standard this year was incredible, with the top 10 at the hour or under at the finish. Me and Luke will definitely be back next year for the top spots on the podium. And last but not least, I finally finished off my season a couple of days ago at the Big Cotswold 1 Mile Swim where I placed 2nd behind Luke. Again, 15 degrees water meant I wasn't swimming as fast as normal but it was good fun anyway; and I'll be back next July when it's a bit warmer to take the win for sure. No hard feelings Luke. Now as you may have noticed, there hasn't been much mention of qualifying for Europeans, Worlds etc for me this year. I abandoned this goal pretty early on this year as I felt I just wasn't going to do myself justice in Rotterdam. I've taken this year to build myself back up, physically and mentally so I can attack next year right from the gun. It wasn't an easy decision to make, but I am happy that I did so. I will be reflecting further on my year so far, my goals that I set out to achieve etc at a later date. For now, I need some time to rest and then when I'm stuck in at Loughborough, I'll reflect properly on my development and achievements this year. Thank you so much for reading this and following my journey. Please share where you can, it really does mean a lot. Thanks to Frome Triathlon Club and Loughborough Students Triathlon for your continued support and encouragement. Special thanks to Pedal Potential for affording me all of these racing opportunities. But the biggest thanks of all has to go to my family and close friends. I couldn't continue to do this without you. -> For another perspective on a lot of what I've covered. Check out Luke's blog here. In short, March and April were two very busy months, hence why it has taken me this long to give it a write up. This seems to be a general trend when balancing student and sporting life but I prefer to be busy than pacing up and down with nothing to do. March started off as usual, training and studying. I had a couple of deadlines in March and plenty of research work to do in preparation for my third year dissertation but I still had time to get some quality training in throughout the month. Swim, bike and run were all going smoothly and days were flying by. You know what they say, time flies when you're having fun! And before I knew it, it was committee election time and I was voted as Loughborough Triathlon's new Chairman with some very big boots to fill. The responsibilities attached to the role have come as a bit of a shock but I have welcomed the challenge and it really makes you appreciate all the work that goes on behind the scenes in sports management. Swim time trials were also a feature this month and given how good I had been feeling in the pool I was gunning for a big result. I made a realistic goal of 4:40 or faster for the 400m and I was absolutely over the moon when I clocked 4:37 another 14 seconds of my previous PB. Now all I need to do is maintain this form as the open water season dawns. For the first two weeks of April I was sunning it up in Mallorca with the team and honing in my form (and most importantly my tan) ahead of the season. The weather was great, with no rain and temperatures well over 20 degrees for the whole two weeks. I had a good first week, gradually building up the volume and intensity all whilst making sure I didn't get too carried away and burn out before the end of the first 10 days. We had a team of around 20 and we had a lot of fun and ate a lot of food; couldn't have asked for a better group of people to be on a training camp with. The second week was almost as good. Almost because the surviving 8 of us staying for the full two weeks were pretty much spent in the last couple of days with fatigue and illness catching up with us. The final highlight for me was a 70km chaingang, one of only two flat days on the bike. Before the ride we all agreed not to get dropped. In the final 20km section I was riding on the limit whilst Dan and Axel flew out the back, leaving just me and three others to battle it out. One of the hardest rides I had done in a while but it's all character building even if your legs are like jelly for the day after. Unfortunately, illness closed out the camp for me and the last two weeks at home before BUCS Sprint were a struggle. 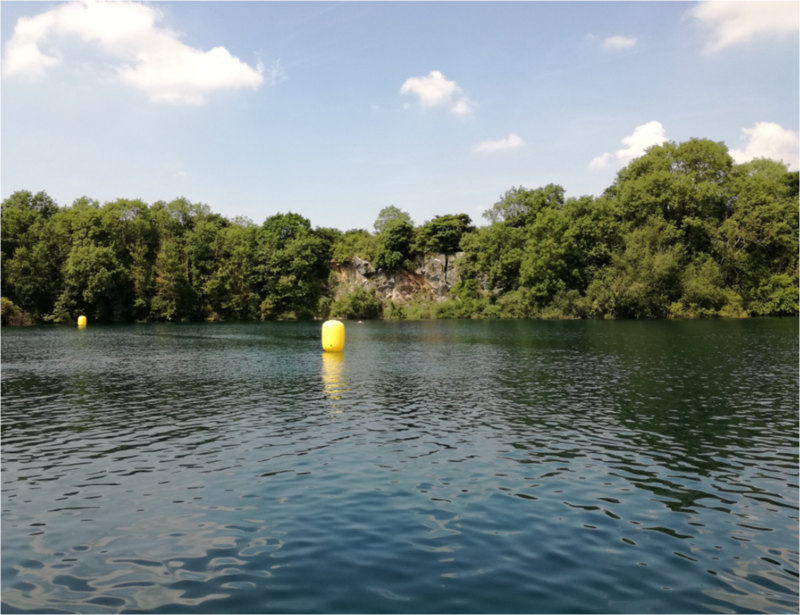 I managed some good swim and bike training whilst I had to take a rest from running as I had strained the vastus medialis muscle in my quad which was sore when running. Annoying, but I have a routine now for minor niggles and injuries and within two weeks I was as good as new. 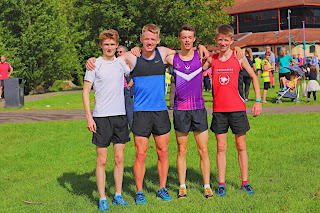 BUCS Sprint was a good test of fitness and a good day out with the team with success across the board. My performance was mostly positive on the day. A decent swim got me off to a good start but I was slightly off the time I was hoping for in the end. And with a wet and windy bike I knew I was going to struggle from this point onwards. It took a while, but I found a rhythm and was making good progress on the course. Smooth T2 and I was out on the run passing a couple of the stronger bikers from my wave within the first 2km. It was from here that my lack of run fitness caught up with me. The legs were heavy and the form became sloppy from the turnaround point. I managed to salvage something in the last km but km 3 and 4 were particularly bad. Since then I have been back at uni for the final term and the final run in to coursework deadlines and exams in late May/June. A slightly reduced training volume is allowing me to put more time into my uni work and also giving me the opportunity to really focus on sharpening up my run form without running the risk of too much stress and fatigue. 21st May - ITU Worlds Sprint Qualifier (Draft Legal), Eton Dorney. 27th May - British Sprint Champs + 2018 ETU Qualifier, Strathclyde. 4th June - National Sprint Champs, Thorpe Park. 10th June - National Aquathlon Champs, WTS Leeds. Thanks go out to Pedal Potential whose support is vital in affording me the opportunity to race where I need to and achieve my goals. As the title suggests, I've got my mojo back! It didn't really leave me completely but it has made a glorious comeback nonetheless. After BUCS XC at the beginning of the month, its been training, training and more training oh and studying too. 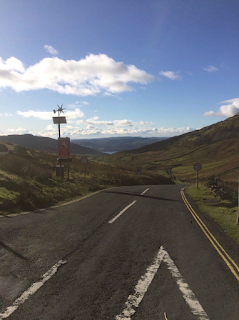 This month has been all about quality and building up the quantity of training miles across all three disciplines. Swim training has been consistently awesome for about three months now and I'm always finding room for improvement and pushing my top end speed that little bit further every week. Most importantly, all this hard work has been leading up to the long awaited swim time trials coming up next week. This will involve covering both the 400m and 200m distances and with a little help from some maths, will give me an updated CSS (Critical Swim Speed) benchmark to help focus my training. I have high hopes and aspirations for this TT. I'm confident a 4:40 or less is well within my reach this time and I might even taper a bit for this to make sure I'm as fresh as I can be and get the most out of my performance on the day. I'd been struggling since Christmas with confidence in my bike handling, but this is where my mojo has made the biggest comeback. I'd been doing a lot of indoor training with power on the Wattbike to try and avoid going out on the roads but this wasn't doing any good for my confidence. All it took was to put myself out there in the uncomfortable and challenging conditions and hey presto, I haven't fallen off and I feel confident on the roads, wet and dry once again. We've had some fairly decent weather by Loughborough's standards and we've been able to put in some quality rides. Everyone is feeling pretty strong, so we've had some pretty fast rides with some fantastic chaingang efforts. And to top it off, I've been feeling really strong on the bike, able to hold my own in challenging efforts and chaingangs as well as the climbs. February also marked the month where I could really start to run properly again. Strength and speed is there but top end endurance is where I need to improve. The strength and conditioning work I've been doing is making sure I'm strong and most importantly injury free and I'm looking forward to more and more run training in March. I think myself and another athlete from the Tri Club are considering attending a local parkrun next week to see what we can do at this early stage. In other news, committee elections have arrived and I've decided to run for Chair again. I'm hopeful that I will get elected and I have lots of ideas for the club over the next academic year. To round it all off, I'm feeling so much more positive at the moment and my training is going exceptionally well for the first time in quite a while. I cannot wait to start racing!!! 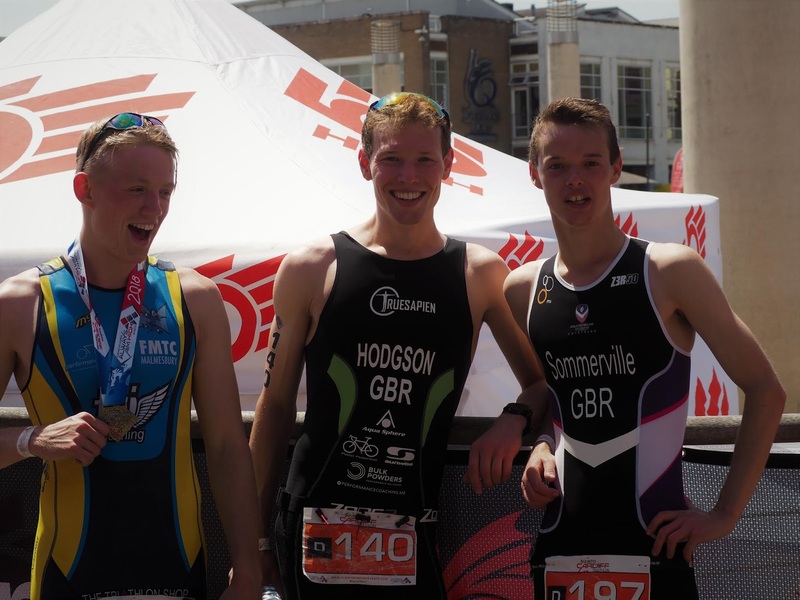 GBR AG and previously Junior Elite triathlete based in Frome, Somerset. Proud alumnus of Loughborough Triathlon. Benjamin Sommerville 2016. Simple theme. Powered by Blogger.